The Coalition for Seniors and Nursing Home Residents’ Rights has made great strides since its inception in 2004. In 2006, assets were no longer considered when calculating cost for nursing home care. We take pride in correcting this injustice. Seniors have contributed with pride to society and continue to do so in many ways and should be treated with respect and dignity. We understand the government has some fiscal challenges just like other jurisdictions in Canada or for that matter in the world. Attacking the most vulnerable people in society who are currently experiencing difficult times, especially the low-income seniors who can least afford it, is certainly not the route to take. We believe the role is to think holistically. The coalition’s role is to advocate and lobby for New Brunswick seniors and those living in nursing care facilities on policies that require improvement. The coalition operates with a volunteer board of 18 members and is not funded by government. The coalition has made several recommendations on fine tuning the existing programs. The province should work with the federal government to implement a Universal Pharmacare Plan, a savings of up to $10.7 billion a year. A comprehensive home care program would be better served if the Regional Health Authorities were responsible for the staffing of home support workers. The current system falls short of providing 24/7 care for those who require the service to continue to live at home, thus forcing choices to move to a special care or nursing home. The implementation of a Public Auto Insurance Plan would bring revenues estimated at $3.5 million per year for the province. We should be investing our money in the province not off shore. Polices and additional recommendations made to government can be found at www.coalitionnb.blogspot.com. The Coalition for Seniors and Nursing Home Residents’ Rights has made great strides since its inception in 2004. In 2006, assets were no longer considered when calculating cost for nursing home care. We take pride in correcting this injustice. Seniors have contributed with pride to society and continue to do so in many ways and should be treated with respect and dignity. We understand the government has some fiscal challenges just like other jurisdictions in Canada or for that matter in the world. Attacking the most vulnerable people in society who are currently experiencing difficult times, especially the low income seniors who can least afford it, is certainly not the route to take. We believe the role is to think holistically. The Coalition’s role is to advocate and lobby for New Brunswick seniors and those living in nursing care facilities on policies that require improvement. The Coalition operates with a volunteer board of 18 members and is not funded by government. The Coalition has made several recommendations on fine tuning the existing programs. The province should work with the federal government to implement a Universal Pharmacare Plan, a saving of up to 10.7 billion a year. The implementation of a Public Auto Insurance Plan would bring revenues estimated at $3.5 million per year for the province. We should be investing our money in the province not off shore. Polices and additional recommendations made to government can be found at www.coalitionnb.blogspot.com. Have you ever stood behind seniors at a pharmacy and watched them make the decision about the cost of their prescriptions and whether they have the money to cover them? This is a valid concern for many of New Brunswick's elderly, and their plight has been aggravated by the policy changes announced this week. The annual co-payment fee limit has been doubled from $250 to $500. How do they cope? Some seniors decide that by taking their medication every second day, the results may be almost as good. Some cut their pills in half for the same reason. Some decide that food and heat are just more important than their prescriptions. In no way does this reduce health costs in our province; in fact, it will increase them significantly. These are the frailest citizens of New Brunswick; they deserve more respect. Shame on you for taking money from poor seniors. We are totally against your increase to $500 per annum for prescription drugs for seniors, especially those in senior homes. Your government seems to be determined to make seniors pay more for prescription drugs, taxes on their homes, and take away some of the benefits we now enjoy which are few compared to what you allow companies to get away with. Remember, the companies who pay for your election campaigns do not vote. The majority of voters in this province are seniors and we will remember that when you need our votes to be elected. This government is being very shortsighted when it comes to taking care of seniors in N.B. The minister says that once the seniors reach the co-pay amount on prescriptions, the government will pay the rest. A shameful way to dip into the pockets of the elderly. She is also encouraging people to get 90-day supplies of medication, so that the government will pay quicker. Not very responsible government. Property taxes are another example: wanting seniors to defer their taxes and pay interest later, while the municipality receives their money that the government has borrowed. Then we have the tax increase on gas. What about the promises made during election? A promise to remove ambulance fees. Zero! The heating application has a new item added - produce your hydro bill for $100 rebate - making it more difficult for seniors to apply. We must not forget the 15 per cent nursing home fees increase, without due notice to the residents of the homes, and the delay in the infrastructure of revocation and building of new nursing homes. In the meantime, we have 518 seniors in hospitals as of January at a cost of $1,000 per day, and 792 on the waiting list for nursing homes. Then we have politicians in Social Development refusing to license the home in Hillsbourgh. It would appear that the government wants seniors to live in poverty and stay in hospital, wasting taxpayers' money, Not responsible government, if I must say. I was utterly shocked and appalled at the Province of New Brunswick’s decision to increase the annual co-payment ceiling for low income seniors from $250 to $500 per annum. Again, the government is willing to save money on the backs of those who can least afford it. These people receive the low income supplement by virtue of which their incomes are the lowest of the low. My mother, who is in a nursing home, will now have to find an additional $250 a year to pay for her medications and, as you know, persons in nursing homes have no funds to do so. It is the spouse, the children or other relatives that must come up with this additional money. Your suggestion, as seen in today’s Times-Transcript, for seniors to get 90 day supplies of drugs in lieu of 30 day supplies will not work. If you had looked into this further you would find that the majority of these people have their medications “blister-packed” and the pharmacies will only “blister-pack” medications for one month, not two or three. Further, these seniors have conditions that require continual adjustment of their medications as their conditions change over time. Also, to receive a 90 day supply which, in most cases, will change before the 90 days are up is a waste of government money to the drug companies. To save a purported $3 million to a $188 million program is not even a 2% savings. And to heap this on the backs of those who seem like they are continually a convenient target is shameful. What does this government have against seniors? The flip-flop on the property tax assessment freeze is another example. You also wanted to eliminate free annual influenza vaccines to those over 65 but this was scrapped after much debate. Your government obviously sees the seniors in this province as vulnerable and a wonderful target to fill the government coffers. This government should be utterly ashamed and all of these things will be remembered vividly when this government desires another mandate in the next election. We are in the news almost every day. We are in the articles you skip over. We are the ones the government is worried about. We are 110,000 in New Brunswick and we will not be silenced. Our numbers are growing. Regarding the recent letter (The same old socialist dogma, Nov. 26) authored by Brian Lutes, he tends to forget when he was selling auto insurance as a broker that many of his clients were socialist and conscious people. It's time the rich pay their share and leave alone those who struggle to survive. We of the Coalition for Seniors and Nursing Home Residents' Rights understand the government has some fiscal challenges, but rather than address the problem on the backs of vulnerable seniors, they must look at other options. only retain $108 per month from their pension. Medication prescribed by their physician is covered with the exception of over the counter medication such as Tylenol and vitamins. Fredericton should work with Ottawa to implement a universal Pharmacare Plan for savings of up to $10.7 billion a year and implement the proposed public automobile (2004) model - projected revenues estimated at $3.5 million per year which would create additional jobs for New Brunswickers and invest the money in the province rather than offshore. It should also replace the income tax structure to two tax rates of nine per cent and 12 per cent and work with the New Brunswick PharmaCheck in collaboration with the N.B. Pharmacists' Association to meet the needs of seniors. The government has many choices to make, but they should leave the seniors alone. Cecile Cassista is correct in her recent letter to the editor. A stable workforce is of utmost importance to the care of seniors. If a facility has a high staff turnover, this should be a warning sign that something is very wrong. In light of the recent news of a seniors facility under investigation for abuse, we should not think this only happens in other cities. Ms. Casssista hit the nail on the head! I believe there should be a local online community or blog where people can voice their opinions on these facilities and their experiences with the treatment of family members and loved ones, and a place where staff members can rate the care they gave or didn't. Whatever it takes to ensure our elderly citizens are safe! I am disappointed (but not surprised) that I again must address the problem of nursing home fees. My last letter to the editor on this topic was sent on May 28, 2010. The Veterans Disability Pension is not a regular pension for years of service, it is an award for injuries suffered during time of war and or service to our country. Will your party totally exempt the Veterans Disability Pension from the financial assessment when a senior enters a nursing home? Summertime and the livin' is easy! Or is it? In New Brunswick, there is an election coming but, to date, it has been a big yawn. No significant issues have emerged. Candidates are being chosen and some are starting to talk to their constituents. It's time for them all to step up their efforts. Hours of bedside care, home support worker wages, benefits and working conditions are critically important. 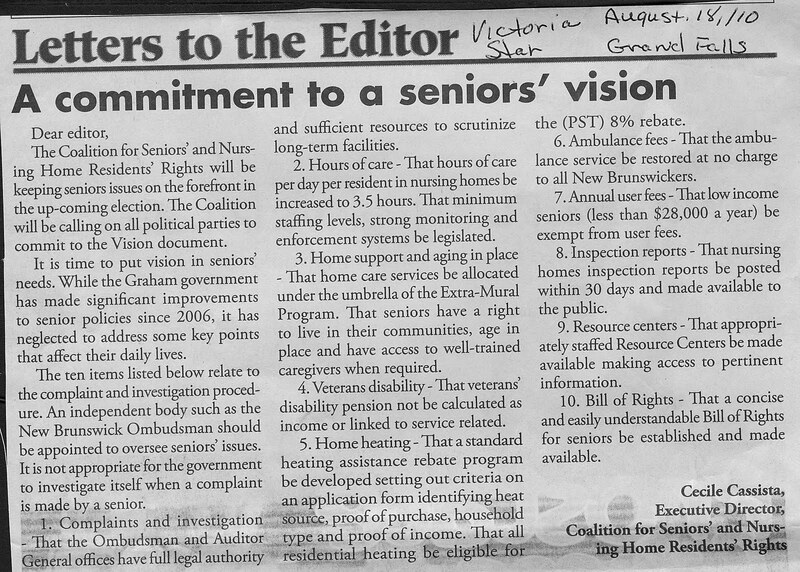 Tories need to listen to seniors May 31, 2010In 2003, the daily nursing home rate was between $123 and $145 a day. Mr. Alward seems to forget that despite our pleas to reduce the fees, his government instead increased them 5 per cent each year. The coalition for Seniors and Nursing Homes Residents Rights, formed in 2004, works tirelessly to protect seniors. Mr. Alward would be wise to listen to them carefully and endeavour to overcome the terrible way his party is perceived to have treated seniors in the past. And don't forget--the Baby Boomers are watching! Let's take another look at the situation. What is often overlooked is that seniors are taxed til their last breath. That's right — OAS, CPP, private pensions, part-time earnings, all taxed as income. Where is the bill of rights for seniors? This is an open letter to Premier Shawn Graham. The Coalition for Seniors' and Nursing Homes Residents' Rights wishes to remind you, Mr. Premier, of your commitment to amend the legislation to permit investigations to be exercised in regard to residential facilities operating under the Nursing Home Act or licensed by the government. To support this change, your letter dating April 28, 2005, to a former president of the coalition states: "We are also prepared to amend legislation to permit investigations to be exercised with regard to residential facilities operating under the Nursing Home Act or licensed by the government. To support this change, a Liberal government will introduce a Resident's Bill of Rights based on the model that is found in the Ontario Nursing Homes Act." Our research based on other provinces shows that the ombudsman offices in some of these provinces have jurisdiction over nursing homes and long-term care facilities. In fact, in Alberta, the ombudsman has jurisdiction to investigate complaints about long-term care facilities and nursing homes. We strongly urge you to amend the legislation so as to permit the office of the ombudsman to carry out investigations and exercise oversight in regard to residential facilities operating under the Nursing Home Act or as licensed by the government. We believe this to be a matter of justice to seniors. The Coalition for Seniors strongly believes it's time for government to address the application of an independent body needed to investigate nursing home complaints for residents' in nursing homes. We believe its time that our seniors and residents of nursing homes be afforded the right and privilege to have the (ombudsman) for their protection. It's not good enough for government to investigate themselves; government needs to be more transparent and accountable to citizens of New Brunswick. The changing of the nursing home system, such as implementing new service delivery models (the public-private-partnership with Shannex New Brunswick Inc.), means it is even more important to give the Ombudsman jurisdiction over nursing homes. Seniors should be afforded the right to call upon an outside independent body to investigate any complaints. The current system handled by the government does not provide recommendations following any reports they receive. This is essential for all nursing homes and society to learn from and be aware of the need to protect our most vulnerable. We have discussed this recommendation with Minister Brian Kenny and other ministers for seniors on a number of occasions, but as we note in today's media, Minister Kenny disagrees with our approach and the recommendation of the auditor general. We are calling upon your office to act quickly in this regard for the protection of our most vulnerable people in society. The Grand Falls branch of the Canadian Mental Health Association is asking you to take note of the seriousness of employee turnover. Since 1982, our branch has been sponsoring the Horizon Centre, which is an ADAPT (Adult Development Activities, Programs and Training) agency. It is subsidized by the Social Development ministry. For the last five years, we have had to post job placements four times due to non-response from applicants. Since January 2009, the Horizon Centre has - finally - all qualified staff members who are excellent and dedicated employees. We fear those employees will soon be leaving. All find their job fulfilling. All are working mothers or mothers-to-be, who are not able to make ends meet by paying for child-care services. Therefore we risk again losing trained and valuable employees. The income and the lack of benefits push them to look elsewhere. We want to maintain the high quality of service the Horizon Centre offers. We have done many fund raising during the 28 years of sponsoring this ADAPT agency, including four adapted buses for transportation. We ask government to implement a salary scale that acknowledges the responsibilities associated with this work, the qualifications, working conditions and efforts as well as the years of experience of all human services workers throughout New Brunswick. We ask for equal pay for equal value. This sector is mostly composed of working women. This is why we ask your support in order to keep our dedicated staff. In Thursday’s edition of the Times & Transcript, the MLA for Moncton West, Mrs. Joan MacAlpine-Stiles, comes to the rescue of Sister Anne Robichaud, the President of the New Brunswick Advisory Council on Seniors (NBACS), relative to comments presented by her at a meeting of the National Advisory Council on Aging (NACA) in Quebec on October 26th in which she states what are supposed to be the top priorities of New Brunswick seniors. Among other things, Sister Anne, the representative for New Brunswick and the head of the N. B. Council, states in both official languages on page four of a twelve page document that « Services that are totally free – this is worrisome as it seems we are creating a new welfare class. » She goes on to say that « young professionals seem to be more interested in their personal well-being and salary than by the quality of services offered to seniors ». Whether Sister Robichaud was in Quebec City or not at the said meeting – which she was not -, but she was there with the same people at the Gerontology Convention on the next day, whether her comments were part of a working document or not is totally irrelevant. While representatives of other provinces were stating real priorities and true preoccupations of their aging populations, opinions of New Brunswick seniors were being completely misrepresented, and that is reprehensible. It is a known fact that Sister Anne opposed the two recommendations of the New Brunswick Ombudsman relating to nursing homes which suggests that the costs of health care services to nursing home residents be the responsibility of the provincial government and that the calculation of family contribution for nursing home services be based on income only. The Lord government disregarded both. Does it not matter that residents be forced to pay from 49 000 and 73 000$ a year to stay in such establishments and that partners are made poor overnight. We all know quite a few horror stories where seniors were humiliated, scared stiff, and robbed of practically all of their belongings to pay for the stay of a spouse or parent. Some were even told to divorce to avoid the worst. To have a true picture of the work of the New Brunswick Council on Seniors, we are being told to read its annual reports. Well, I did. In paragraph 5.2.3 of the 2004-2005 report, it is said that the Council presented the Minister with a report on nursing homes. What a hard time it has been to get of copy of this document. Why was it not public? What we know now is that the Council did not encourage the government to put into effect the Ombudsman’s recommendations. It remained coldly silent on such a prime matter. In the Quebec Report, provincial and territorial councils were asked whether new legislations relating to seniors had been introduced in their respective jurisdictions. Sister Anne simply states (page 9) relating to initiatives brought forth by the Lord government : « We shall see if the newly elected (Liberal) government follows trough on the work that was begun. » Playing politics is one thing, being the President of an Advisory Council on Seniors in another. One should choose. Sister Anne made a blunder by misrepresenting seniors in what she calls her « working document » at the Quebec City meeting. Why would she not admit it and apologize to all concerned. That would show nobility of soul. And, by the way, were the members of her Council aware of her presence in Quebec and of the content of her « working document »? New Brunswick Seniors’ Issues? My eye! On October 26, in Quebec city, all provincial and territorial seniors’ councils were invited to appear before the National Advisory Council on Aging (NACA) and share the top three concerns of seniors in their respective jurisdictions. The report has twelve pages. Eight lines on page four, written in both official languages, were forwarded by the New Brunswick Advisory Council on Seniors to this effect. It is true that the president for the New Brunswick Advisory Council on Seniors, Sister Anne Robichaud, was not in attendance on that day, because, according to her, she had missed the bus. But she was present at the Gerontology Convention at the same place on the next day. Her report had arrived early in due time before the National Council for consideration. We learn from the national report that in provinces such as Alberta, seniors are concerned with the lack of staff and staff training in seniors housing facilities. They regret the lack of affordable transportation in smaller communities when the need to travel for medical services in larger communities arises. They deplore the shortage of home care assistance which could help seniors remain independent in their homes for as long as possible. Seniors in the province of Quebec are concerned with the sustainability of the health care system particularly the wait times and resource allocations. Housing and home care and income levels are also important issues, since a great many seniors are amongst the poorest population in the country. As it seems, in New Brunswick, seniors would be concerned that free services in this area could create a new welfare class. According to Sister Anne’s report, they are also preoccupied with the fact that young professionals working in the field seem to be more interested in their personal well-being and salary than by the quality of services offered to seniors. Sister Anne may say that these statements are being taken out of context, but they aren’t. They appear in black and white on the fourth page of the NACA report. It is simply incredible that these three issues would be the main concerns of members of the aging population of this province. We all know that the simple fact that one partner has to avail himself or herself of long-term care creates poverty, often times accompanied by humiliations, fear and intimidation. It costs from 49 000 to 73 000$ a year to live in such institutions. Some resort to bankruptcy while others are advised to divorce. When the new policies of the present government come into effect, it will still cost 25 500$ a year. One only needs to make his or her own calculation to see how the family revenue and the quality of life will be affected. If Sister Anne does not see that, others, who are not part of religious communities, do. If I were an employee in the system, I would be raging mad. People that are overworked due to lack of staff, and rather generous of their time should be commended rather than denigrated before the rest of the country. The New Brunswick Advisory Council on Seniors owe them a thorough and sincere apology. Who else would think of presenting such con work before Canadian Seniors Councils’ representatives, and think that they could be taken seriously? In a long article published in the December 16th issue of l’Étoile, Sister Anne Robichaud tries hard to hide her blunder. In a statement where she states the mains concerns of the Seniors in the province sent by her to the National Advisory Council on Aging in Quebec on October 26, 2006, she reports that services that are totally free are worrisome as it seems we are creating a new welfare class. She further adds : « Young professionals seem to be more interested in their personal well-being and salary than by the quality of services offered to seniors ». What she omits to say, is that she opposed the New Brunswick Ombudsman’s two recommendations in his 2003-3004 report in which he wants health services in Nursing Homes to be the responsibility of the province and that the calculation of family financial contribution residents be based on income only. That has not been without surprising quite a few. So it would create, so it seems, a new welfare class, yet how many partners are left in poverty when faced with fees going from 49 000 and 73 000$ a year for long-term care. And, furthermore, she knows very well that even with the changes that brought forth by the present government, it will still cost 25 500$ a year to stay in a Nursing Home. She underlines quite a few times in her text that what was sent to Quebec was a working document. Whether it is or not, her comments distorts the reality. She goes as far as to say that making the document public is a lack of professional ethics. The document was not confidential. When a provincial Council president has nothing else to say that young professionals are more preoccupied with their well-being and their salary than by the quality of services to seniors, it would be preferable for her to say nothing. This is not one of the main preoccupations of the majority of seniors for the province. One wonders if it is the stand of the other members of the NBACS? Whereas presidents for other seniors’ council in Canada did present real and serious concerns of their aging population, Sister Anne presented a falsehood because it did not reflect the preoccupations of seniors in the province. Were the members of her Council aware of what she was going to present in their name even though it might have been a working document? If her comments had been meaningful and had given the real picture of the province’s seniors preoccupations, she would not have objected to their publication and would not be talking about a lack of professional ethics. She has painted herself in a corner and is trying to get out.